This is a post I wrote recently for Mark Kalch as part of the Adventurers Blogging Chain. Keen to hear your thoughts on your favourites! Sruvival Stories: Which is the greatest of all time? Survival stories have it all – blood, gore, emotion, toil and triumph, and the chance to see humanity at its finest and fiercest. For lessons in how climb up from crushing defeats or overcome the most extreme and impoverished conditions, they ooze offerings. There are some really wonderful and incredible stories out there. Having pitched my piece as a ‘Which is the greatest…?’, I imagine that brains will already be ticking through the files of stories you have read or heard about, and perhaps a handful of you are already standing up and waving your story flag at the screen, shouting the title of your favourite Great. I’m talking really fundamental and basic, where the outcome of a survival bid is digital, yielding either life or death as prize or price. That simplicity is neatly summed up here by Dougal Robertson when he wrote, ‘There are no failures in the School of Survival’. All went well for the first half of the world, as they hop scotched their way across the Atlantic and down into the Southern hemisphere and the Pacific Ocean, taking with them a handful of student hitchers along the way. They had their four children on board too, twin boys of eleven, and a teenage boy and a girl – the latter deciding to stay in Cuba as they passed through. The Robertson’s fight for survival started off the coast of South America, just hours after the Lucette had left the coast, bound for the other side of the ocean. The boat had been struck by killer whales and sank within a minute. Sixty little seconds. That’s all, one tiny minute – precious, frantic moments in which to salvage anything and everything possible from the boat, deploy the life raft and get everyone overboard and safely into the raft. This all happened in the days before EPIRBS (satellite rescue beacons) and satellite phones, or at least before they were available as consumer priced products, meaning that the five Robertsons and their student compadre were utterly alone. No one knew where they were or what had happened, making rescue a statistical blip of improbability. 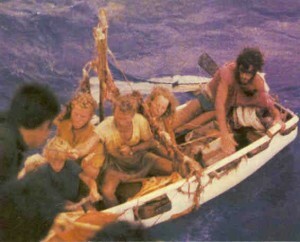 Stores included a bag of oranges, lemons and onions, a limited ration of water and biscuits and a basic stock survival kit in the raft; besides that, there wasn’t much else. For clothing, it was all they were wearing at the time, namely t-shirts and shorts or just swimming trunks. The challenges and triumphs of six people squashed together in a leaking raft for an unknown number of days in the open ocean would make the book a good read even if it were written by the most mundane of authors, but Robertson’s writing is rich and full. Every cold wave is felt; every long hour of boredom and hunger gnaws and numbs in equal measure, and the sleepless nights of the skipper calculating the likelihood of rescue stabs as though it were you lying awake in the puddled raft wondering when you will starve. It is savage and brutal at times with some real tummy-turning moments, the sort that will make any vegetarian wince and anyone not knowing what an enema is reach for the OED. I turned the last page feeling exhausted but elated, having journeyed to the depths of despair, starved and parched with them, but having swam in the good moments and victories too. Humanity at its rawest and best, there are examples of leadership and followership that all would do well to read in or out of the adventure world, with moments of ingenious innovation and adaptation that should inspire anyone with half an interest in overcoming challenge, and beautiful exchanges of love and belief that made me smile and cry in swift succession. All of this is threaded with hope, determination and a quintessentially British sense of humour and stubbornness and, I am pleased to add, a happy lack of cannibalism. I am even more pleased to write that all crew survived, including the young twins, and after a period of rehab and refeeding, all six bounced back to be healthy, fine and fit. Physically and emotionally, this addition of children must have added layers of challenge to their plight and, undoubtedly a focus for hope and commitment to effort, too. For me, it is this element which ranks it up there as one of the Greats and Dougal Robertson in particular as Skipper of the crew, as something of a hero. Mr Robertson, I salute you, Sir – yours was an epic. What an epic. Great news about Mars, will that mean you will be eating Mars bars all the way round this time. Are Cadbury’s helping out too. Keep up your blogs they are great. I would love to include a quote from yourself, plus a photograph from when you were at school – failing that an up to date one would work.